The penultimate 30 Artists in 30 Days, artist number twenty-nine, is cellist-singer-songwriter Unwoman. The name was apparently inspired by the unwomen from Margaret Atwood’s novel, The Handmaid’s Tale, and refers to the label given to women who didn’t fit into that rigid society. 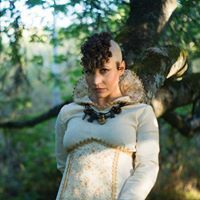 Her music, described by Russian gothic label Shadowplay as “dark trip wave”, suits the Steampunk conventions she regularly features at. Besides being selected as today’s artist, she also, unbeknownst to me, has just won two reader’s choice Steampunk chronicle awards. Go Unwoman! Currently Unwoman has 293 patrons pledging $593.61 per song. See all the 30 Artists in 30 Days here.